My family started ordering "S_'s" Pizza when I was in middle school. Every Friday night. Same order. Delicious. The T family often continues the tradition when Mimi (my mom) comes over on Fridays. Everyone is tired from the long week and pizza just makes sense. I got really bored last weekend. So bored that I didn't feel like ironing or weeding the garden. I was in a crafty mood and decided to make a wreath for our back door using only items I had in the house. Meaning I would not spend an extra dime on it. I had an old grape vine wreath to use as a base, but beyond that I was stumped. I really wanted to use some cardboard to make an embellishment, but it usually takes T about 5 or 60 reminders before he'll bring something like that home for me. Then my eye's fell upon the holy grail of trash to treasure: pizza boxes. I considered carving a monogram out of the cardboard, but everyone does cardboard monograms these days. That's when I got the idea to try a bird. I found a silhouette I liked on Google images and freehanded the outline onto a piece of paper, which I cut out and traced onto the cardboard. Very carefully, without slicing any major arteries, I used T's box cutter to cut out my bird. 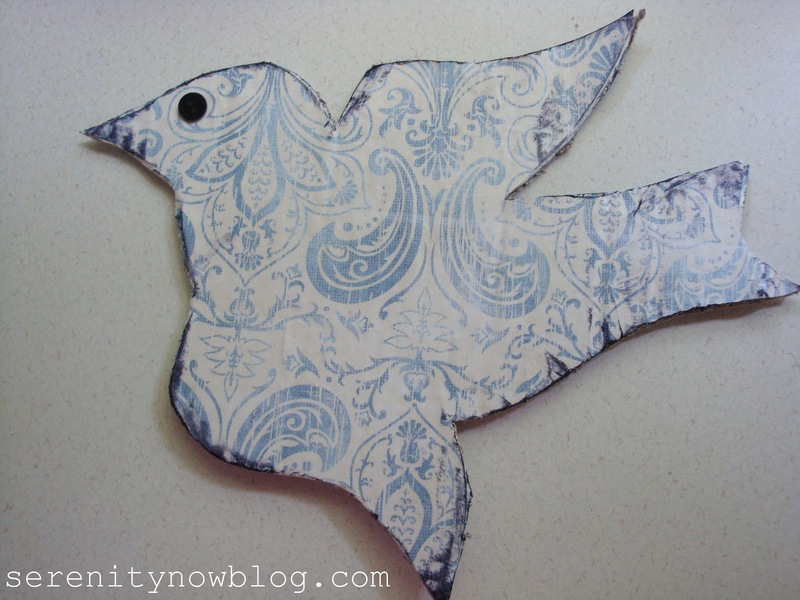 My next brilliant idea was to wrap the bird in twine and hot glue it in place. I spent the better part of naptime saying very bad words under my breath and ended up with a big wad of twine in the trash can. So next I spray painted it. Meh. You could see the places where I stabbed the bird with a stapler in a blind fit of twine rage. 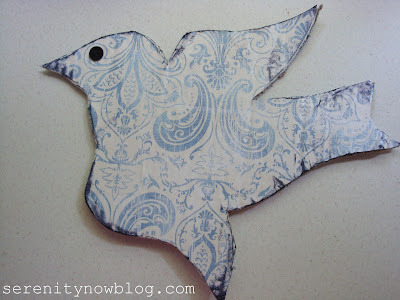 I ended up Mod Podging some scrapbook paper onto the bird and distressing the edges with a black ink pad. And adding a small black button for an eye so it can stare at me watch over us as we play in the backyard. Not bad for a pizza box that was a real "roadkill rescue." And the price was even better since it didn't cost a cent to make! Linking to The CSI Project for their Roadkill Rescue Day. loved it! you post made me giggle! Nice start to my morning :) thx! Very Cute!! 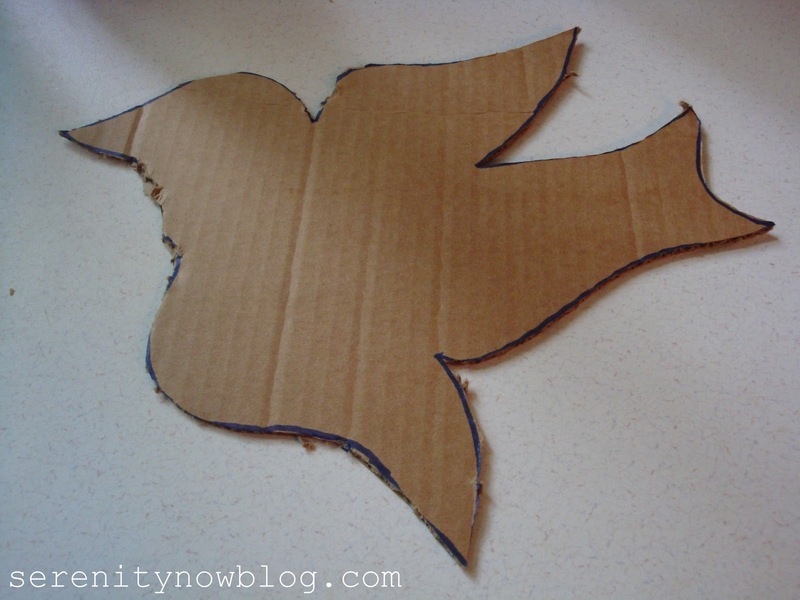 I love the bird and would never have thought of using a pizza box. So cute and clever! The bird is terrific!! And all out of a pizza box. We do pizza on a regular basis too. It always make sense!! Ha! Very cute! I love using whatever is on hand!! Amanda, this is great! "Roadkill rescue" always makes me think of big-time furniture items, but really it's all the little items that make up the bulk of trash. This is a great use of an item that would otherwise have been bound for the dump! I love it! Great idea to re-use a pizza box! I love your wreath! You have inspired me to make something with all of the empty diaper boxes out in the garage! this is the cutest idea! Thanks for sharing. talk about thinking out of the "box" hehe sorry. just had to! That is sooo cute! Love that cute little bird! Aren't you smart? My pizza boxes just go to the trash! Good job! This is so cute! I never think of things like this. I did some swearing myself today as I was hanging things and it fell off the wall and I broke a dish! Aren't you clever and crafty??? Very cute. Clever idea! I think I have all of those items too! Well, not a pizza box but I do have plenty of cardboard saved from some packages that came in the mail! If I find some free time, I may just have to copy this idea! super cute idea!! i may have to try that out!! Your wreath turned out wonderful!! I love the bird and what a great idea to recycle a pizza box! A successful project completed. Not spending any money just makes it better. I loved this phrase "blind fit of twine rage." It made me laugh as I realize how I sometimes get when a project is frustrating me. What, what, what! Pizza box! You are a genius. Love your wreath. 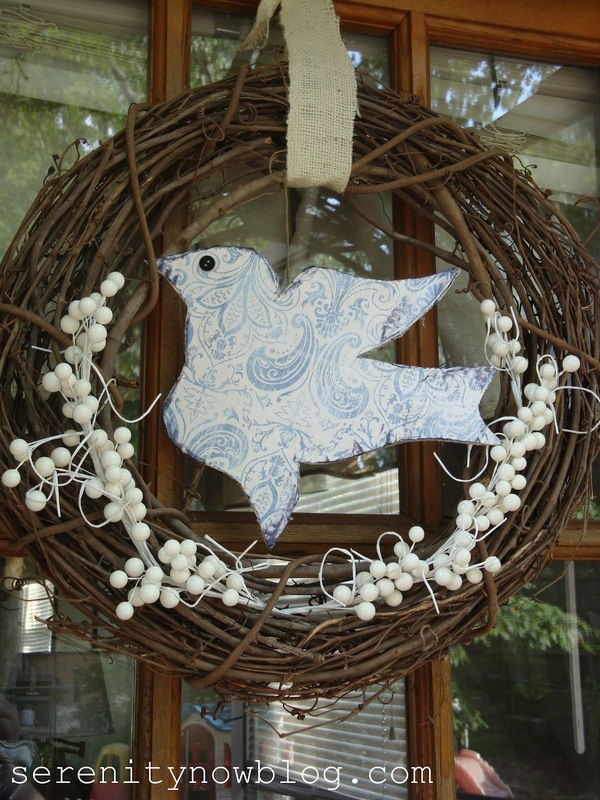 I love the color of the paper on the bird and the wreath is just beautiful! I love it! I have a grapevine wreath waiting to be updated, and I love your bird -- so I feel a project coming on. Had trouble getting the button to work...so, it's all fixed now with your link! Sorry about that!